So, you think you might want to learn how to scuba dive, but you’re not quite sure? 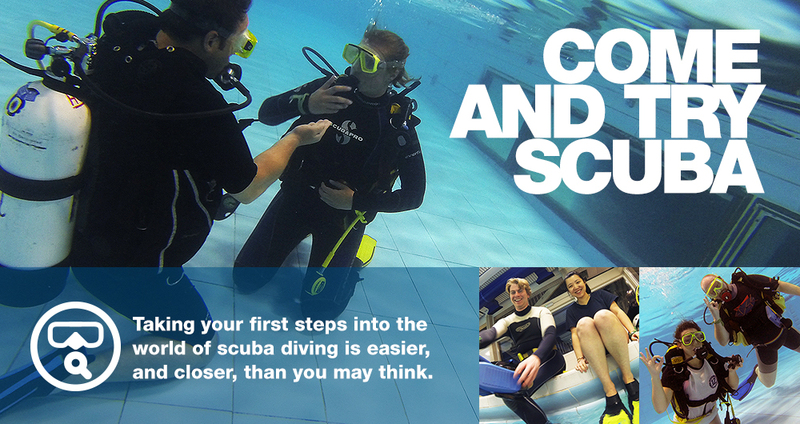 Then why not do a try-dive at our central London pool and discover if this amazing sport is for you? Holborn Sub-Aqua Club has been introducing people to scuba diving for over 50 years and our prime location (we are based at the Oasis Sport Centre near Covent Garden) makes us the ideal choice for those who live or work nearby. Holborn has always prided itself on teaching scuba to a high standard and it is no different when it comes to our try-dive sessions. Each try-dive is conducted one-to-one with a fully qualified instructor and safety is always our uppermost concern. Being a club, as opposed to a commercial dive centre, we always hope that those we train will continue to dive with us for many years to come. For this reason we invest a lot of time and effort to make sure we train those people as well as we can – they are our dive buddies of the future! For your try-dive session we will provide all of the equipment you require, you just need to bring yourself, your swimming costume and a towel (and 20p for the locker). The session will be conducted at your pace and you can do as much, or as little as you like. Sessions start around 6:45pm and last around two hours with the actual pool dive usually lasting between 35 minutes to an hour. Try-dives at Holborn cost just £25.00, which is a price we think you’ll find hard to beat. Once you have completed your try-dive you can go on to book a full learn to dive course and begin your diving adventure. So, are you interested in taking the plunge? If you are over 12 years old, able to swim reasonably well and don’t have a medical condition which would endanger you if you dived, you can do a try-dive. All you have to do is fill out the booking section opposite, hit the send button and you’ll be on your way to a truly unique experience. But hurry, places are limited. Please note: 12-17 year olds must be accompanied by a parent or guardian and give advance notice when booking. Perhaps you are already a qualified diver but it has been a while since you last dived? Maybe you are off on holiday and you want to brush up your skills before you go? Holborn offers refresher dive sessions for qualified divers, for just £75.00, most Wednesdays. During these sessions you will be one-to-one with a qualified instructor (or one-to-two if you prefer) and will cover all of the basic diving skills from the Ocean Diver course (equivalent to PADI OW/AOW). At the end of the session you will receive an internationally-recognised certificate. If you are interested in a refresher dive, please contact us. refresher sessions, for up to 6 people, several times throughout the year. However ad-hoc try-dives can also be scheduled for most Wednesdays. If the date you are interested in is not shown above, or if you require more than 6 places, please contact us. Please note – payment is via PayPal but you do not need a PayPal account in order to book. If you are unable to attend your scheduled try-dive for any reason please contact us as soon as possible. If notified by you more than 24 hours prior to your booking we shall either reschedule your try-dive or refund the fee less a small administration charge. If notified by you less than 24 hours before your booking we will be unable to refund your fee. Any new booking will require a further booking fee. Holborn 0130 is a branch of the British Sub Aqua Club. Our nationally qualified instructors are accredited to provide scuba diving training and to award internationally recognised qualifications.